Pope Francis’ one-day pilgrimage to Geneva will mark another major ecumenical moment in his papacy. While he will celebrate Mass for the nation’s Catholics and meet with Vatican diplomatic staff working at U.N. agencies there, the trip’s major focus is highlighting the Catholic Church’s commitment to seeking Christian unity and recognizing the unique contribution of the World Council of Churches. Of his 22 apostolic trips abroad, the upcoming June 21 pilgrimage will be his second that’s so intently focused on ecumenism. In 2016, he traveled to Lund, Sweden, for a joint commemoration with the Lutheran World Federation marking the 500th anniversary of the Protestant Reformation begun by Martin Luther. This time, Pope Francis heads to Geneva — where John Calvin led the reformation in the 16th-century — to celebrate the 70th anniversary of the founding of the World Council of Churches. The WCC is a fellowship of 350 member-churches, representing Protestant communities and most of the Orthodox churches in the world. In total, these member churches represent 500 million Christians worldwide, making it the broadest coalition in the ecumenical movement. Much like the United Nations grew from the desire to avoid war and divisions through the creation of a united body that could work together for peace, the WCC also grew from a similar desire — not of nation states, but of Christians and church communities — to join together for the good of the world in Christ’s name. The pope shows all Christians, with his words and gestures, how “they should live God’s word by putting themselves at the service of the least in the world,” he told the Vatican newspaper, L’Osservatore Romano, June 11. The Rev. Martin Robra, who works with the WCC on relations with the Catholic Church, which is not a full member of the council, said he hoped Pope Francis’ visit would foster more cooperation among Christians in helping further Christian unity, bring justice and peace to the world and aiding those in need. “It looks like a new spring has been reached with Pope Francis and his initiatives,” the theologian and evangelical pastor told the Jesuit journal, La Civilta Cattolica, early this year. The Lund visit was a major milestone on this journey, Rev. Robra said, and Geneva represents another bright ray of hope chasing away that “ecumenical winter” of the past. The biggest achievement to come out of the decades the Catholic Church and Christian communities have been working together may not be the different documents and agreements, Father Andrzej Choromanski, an official at the Pontifical Council for Promoting Christian Unity, told reporters June 12. The real concrete sign of success, he said, is how the two sides see each other and treat each other — no longer as enemies, but as friends. “This, for me, is the most important,” he said. This will be the third time a pope has visited the World Council of Churches. 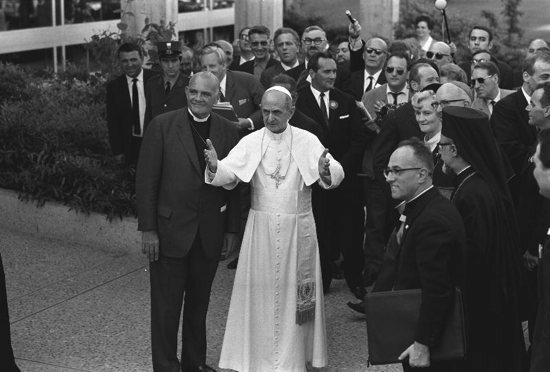 The first visit by Blessed Pope Paul VI in 1969 was a landmark revolution. With the Second Vatican Council, the Catholic Church had gone from rejecting to endorsing an active role in the ecumenical movement. The Vatican had seen the WCC as valuable partners in this new journey, first by inviting them to take part in Vatican II as observers, then establishing a joint working group between the church and the WCC in 1965. While there were — and still are — serious difficulties and obstacles preventing full unity, Blessed Paul showed, as the leader of the universal church, what this ecumenical partnership could look like on the world stage. “Geneva is one of the cities in the world where most painfully one becomes aware of the division among Christians,” he said in his address June 10, 1969. “But the atmosphere of peace and reciprocal esteem, so joyfully established in our day,” allows them to see so many opportunities where they can work together, such as with helping the least and building world peace, he said. Blessed Paul said it was “with this spirit I come to you,” filled with seeking God’s glory and fulfilling his will, making the pope become, in a way, a pilgrim of reconciliation. After that gesture of cooperation, St. John Paul II visited the WCC in 1984 as a confirmation of that quest for unity, as he did throughout his pontificate. Pope Francis’ trip is another major step in this pilgrim’s progress, and it will be the first papal visit to Switzerland since 1984. Switzerland has seen an increasing trend in people professing to not be religious. A nation that was more or less half-Protestant, half-Catholic shows the same downward curve in both religious affiliations the past 40 years. But the pope has a particularly unique way of knowing the concerns of today’s young Swiss Catholics: the on-site presence of 110 Swiss guards. “May we always trust that the Holy Spirit will continue to assist and guide our journey, often in new and sometimes unexpected ways,” he said.